This was an early rendering of the project, we like comparing it to the final thing. This was one of our first major projects as a firm and really how we got our start. The design is all about highlighting the storage doors while creating a building that doesn't feel like your average storage building. Really, it feels more like a contemporary office building until you notice the storage doors behind the glazing system. While Extra Space wasn't actually our client, they were contracted to manage the project once complete, so the green doors and accents reflect the company's brand. Often times a neighborhood meeting may be required at the beginning of a project to inform the community of the planned development so that they can have a chance to voice their opinion on the matter. The neighborhood meeting was well underway on this project with the city planner talking about the processes and requirements of the project when finally it was our turn to present. 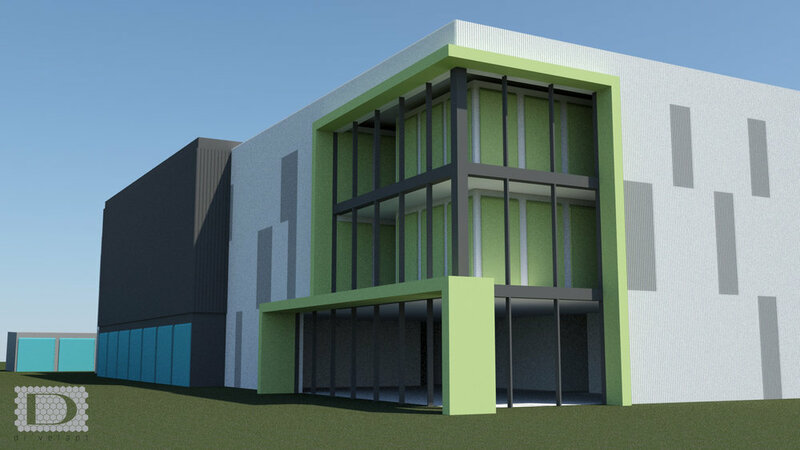 We broke out the renderings and people immediately started to say that they didn't know self storage could look so good and expressed their relief that they were getting a nice looking building, something they hadn't anticipated when they heard what was going in next door. It was fun to see people getting excited about a storage project. This site is one of the most difficult design challenges we have faced. It is less than an acre and there is a 45 foot elevation change from one side of the site to the other and the city had a number of zoning restrictions. In the end we broke out our tetris skills to fit over 80k square feet of building and 650 units within the boundaries and site constraints. When this project was going before the zoning board we put together a little presentation to help explain why it was impossible for us to meet the letter of the zoning code. The board loved the presentation and accepted the variances to the code. Check out a video of that presentation and the slides within the gallery above. Ultimately our client determined that the cost of building on such a challenging site was not going to work for them and the project was cancelled before construction began. It was a fun challenge to work through the site conditions and we are left with some nice renderings of what could have been. 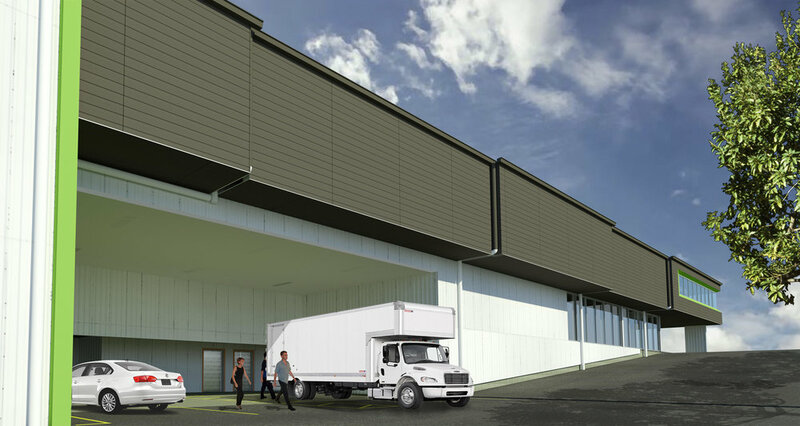 We firmly believe that one of the strongest ways to market a storage facility is through the design of the building. Sure this project could have been just a grey box, but we feel (and our client agrees) that having a building that is memorable is money well spent. Never having had a chance to do any visualizations on this one past some early renderings, we are excited to see this project in construction and watch it really develop into an attractive building. The funny thing about Storage is that it is needed all across the county. At di'velept we have been fortunate enough to be able to expand our operations to the Eastern Seaboard. This project is going to be a rehab of an old manufacturing facility that was in need of a little TLC. Construction has already begun, so we will be posting some more photos soon. After having been a part of storage projects in many far flung places we are finally getting around to designing some storage in Utah. Soon the residents of West Valley will have a shiny new place for some extra storage.